Whitehaven Male Voice Choir along with choirs from all over the country got together last November to raise a staggering amount of money for Cancer Research UK with The Festival of Brass and Voices 2006. 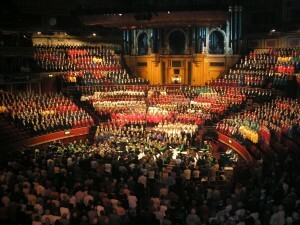 The event, which took place at the prestigious Royal Albert Hall, took the Yorkshire based Festival committee almost three years to organise. Now the organising and fundraising has paid off as the total sum raised for Cancer Research UK’s vital work is a monumental £95,000. The impressive sum was presented to Cancer Research UK at the Leeds science centre at St James’ Hospital where Cancer Research UK fund £5.6 million of world class research. The huge cheque was presented to Cancer Research UK’s Claire Marshall by Peter Dix, Choir Liaison Officer for the Festival; William Relton, Festival Musical Director and David Johnson, Band Manager of Sellers International Band. The Chair of the Festival, Syd Harris said: “I want to thank all the choirs and the two bands for all their hard work on the Festival of Brass and Voices 2006. The event was a really impressive occasion and we already have choirs signing up for the next event in October 2009. I am delighted to be able to present the wonderful sum of £95,000 to Cancer Research UK on behalf of all the choirs, bands and the fantastic Festival organising committee”. Claire Marshall, Cancer Research UK’s Community Fundraising Manager said: “Not only was the Festival of Brass and Voices 2006 a wonderful and moving occasion, the Festival committee and all the choirs and bands have managed to raise such an impressive amount of money for Cancer Research UK’s work. To raise £95,000 is a huge achievement and the Festival is a living embodiment of our vision “Together we will beat cancer”. Cancer Research UK is the world’s leading charity dedicated to research on the causes, treatments and prevention of cancer. We support the work of over 3,000 scientists, doctors and nurses working across the UK. Our annual scientific spend is more than £213 million, which is raised almost entirely through public donations. A recording of highlights of the concert is available on CD at a cost of £10 from the Festival organisers: ‘The Noddle’, Scapegoat Hill, Huddersfield, HD7 4NS. Tel: 01484 647146.